I have lots of “friends” online. These are folks who I may or may not know in the real world, but I tend to see a lot of them online in places like Facebook, Twitter, Instagram, etc. What I’m finding is that my “friends” who have pretty hard set political views tend to share the same kind of stuff, whether they’re liberal or conservative. If I were to put them in the same room together they would all probably be civil, get their views across in a relatively sane and measured way and then afterwards in the safety of their own environs they’d point out the idiocy of the other in a prototypical, Southern, bless-his-heart kind of way. However, those same people have no problem sharing the most banal and inflammatory crap put out by “infurianators” on an almost hourly basis. 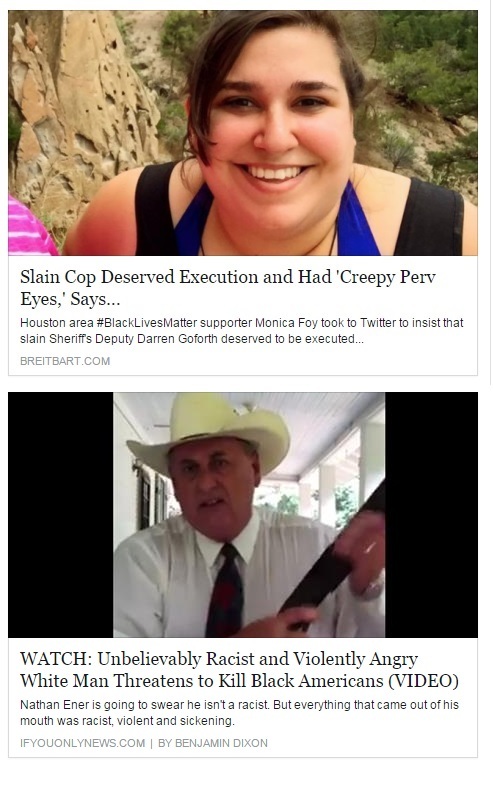 Below is a picture of two “shares” that literally showed up on my Facebook timeline in order, one from a liberal and the other from a conservative. I deleted the friend info to keep the names off a public post, but believe me the items are legit. I get tired just thinking about the crap that’s gonna show up online until the 16 election, which thankfully is just a short 14 months away. And you should see the comments under these things. Believe me when I say that both conservatives and liberals are prolific in their hyperbolic outrage. This entry was posted in Social Media and tagged friends, social media, trolls on September 2, 2015 by Jon Lowder.